“All the class cheat. And all the years cheat. The teachers don’t know, but they all cheat. Everybody cheats.” – Student X. It came up in class after a discussion on honesty – so I started talking to all my young learner and teenage students about cheating in class and on tests. Did they cheat? Why did they cheat? How did they cheat? I don’t think that I’m particularly naive when it comes to cheating. I know it goes on and I sort of expect it a little – I don’t condone it, and I don’t particularly see the point of it (at least in my teaching context), but I watch for it when my students are doing tests and put all the chairs in test configuration, I try not to be distracted while they are working. But I was somewhat taken aback by what they told me…. I think if you had asked me about if before, I would have said that probably around 15 – 20% of students in my classes would admit to cheating. In what was a relatively small informal survey of 40 students between the ages of 12 and 17, only two students said they didn’t cheat. That’s right – 95% of my students cheat on tests at school. So what follows is a sort of write up of the notes I took while chatting to them about this. I was upfront with them that I would use what they told me in a blog post or article and they were fine with that as long as I didn’t identify them directly. The reasons here seem to be a combination of living an over-scheduled and overworked student life, along with a healthy dollop of test anxiety. There is in some cases a fear of judgement from parents, teachers, and even peers about the consequences of failure – or not even failing. I remember in a previous life giving a 12 year-old girl back a test on which she had scored 81% and her being upset because her mother expected her to get at least 90%. From talking to my students, it seems that test scores are the be all and end all of the education system here. I don’t know how true that is – it might be that teachers in Portugal have a different perspective, but if so, that isn’t communicated to the students. I should point out that I don’t know exactly which tests my students were referring to – I got the impression that they were talking about summative tests that were being used to determine grades for the year, rather than impromptu formative tests, but I also got the impression that this difference is probably lost on them. A test is a test is a test. And for my students, the goal of the education system is to get good test scores because that is how absolutely everybody judges them. Even in my context of private language school teaching, I have had conversations with parents where I have started talking about attitude and behaviour in the class and the parent has said “Never mind all that, what did he get on the test?” In another conversation with a student, I tried (in vain) to calm his test anxiety by pointing out that in later life, no-one will even bother looking at the test scores he’s getting now (aged 14). “No, no, no!” he replied. “Companies look at it when you apply for jobs.” Again, I’m not sure how true that is, or whether it is part of some motivational “Project Fear” from someone in this student’s life. But he believes it and as a result stays up until 3.00 a.m. studying for tests he’s got the next day. So to begin with then, the results of the tests matter to students and every test, it seems is high stakes. Add to this the fact that students are being tested regularly in a wide range of subjects and it seems that there is always a test around the corner to prepare for. When I set homework, students regularly complain that they have two or three tests the following week and can’t I let them off this week? I sympathise with them, but official policy is that this is their problem, not mine. This workload then leads to a “just in time” system of studying where they are always preparing at the last minute, and in this situation they either end up feeling underprepared, or not having had time to prepare at all – so to get the grades they feel expected of them, they cheat. The range of methods is quite impressive and ranges from the mundane to the extreme and from low tech to high tech. 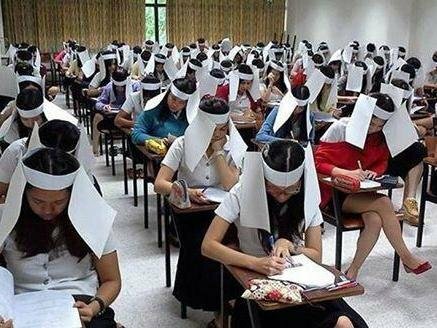 The smartphone era has not been kind to test security, but the biggest boon to cheating is the inattentive teacher / invigilator. Very few of the methods they told me about would survive a teacher who got up and walked around the room a bit more and tried to impose stricter test conditions. I was told about teachers who left the room to go and do something else for five minutes, or teachers who are trying to invigilate more than one classroom at the same time. Teachers who are getting on with marking, more interested in reading their book, or who are unaccountably deaf. It’s not possible, without talking to some of the teachers concerned, to say why this is, but based on my own experience I would say that I tend to use tests as an opportunity to get marking done, or to jot down a few ideas for things I’m working on, or even in extreme situations to plan lessons for the next day. I rarely do nothing while I’m invigilating student tests, not least because doing nothing is so flipping boring! But also, because for the most part I trust my students. Obviously, not anymore, but I did trust them! 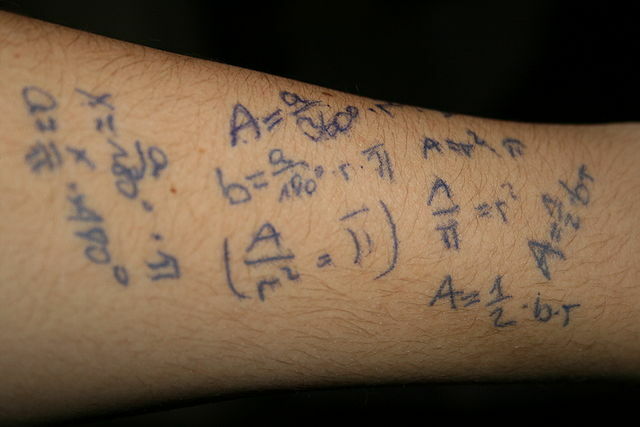 I have never seen the point in my students cheating, but that is perhaps because I tend to view the tests more diagnostically and not as summatively as my students do. whispering / talking to each other and asking for specific answers. crib sheets / cheat sheets – in pencil cases, under watches on wrists, in calculator cases, rolled up inside biros and pen cavities, sellotaped to the back of the person sitting in front of you and initially concealed under a jumper or jacket. recording answers / information onto their mobiles and playing it back through headphones during the test. My favourite though, is this: a student who somehow hacked or accessed his teacher’s email account and downloaded a copy of the test paper the teacher had sent herself for printing. The student then printed out his own copy and filled it out in advance of the test, and then swapped test papers in the exam, submitting his pre-filled version. Teachers – time to change your passwords! I’m not sure there is a real answer to the question. It feels a bit as though trying to police all of the different cheating methods is a bit like stamping out the glowing embers of a fire in a field, while ignoring the burning barn behind you. It seems to me as though the problem is perhaps not so much the individual acts of cheating that occur, but the system that causes it. The nature of a test and whether tests fulfill their function is perhaps a question for another time. Personally I have a hard time with the notion that a single answer, resulting in a percentage point difference, tells us whether a student is better or worse than another student. All a test really ever tells anyone is whether a student can answer the specific items on the test. Yet, because tests are meant to be representative of a subject area we imbue them with such overblown importance that they become the only thing that matters. This is not to say we should get rid of tests completely (though some do argue that), as they can be useful tools, but perhaps they should be used more sparingly, and perhaps teachers and students could have more discussion about what the tests really mean and what they are used for. If teachers and students can talk about test anxiety and how to manage it, then perhaps the way that students view tests, and consequently how they approach tests, will be healthier and more reflective of their true ability. Also writing answers on tippex tape & rolling it up again – v fiddly. And apparently there are a couple of apps that will solve maths problems for you if you take a photo of them. There’s an overwhelming feeling here that the end justifies the means – a reflection of the imbalance in this country’s approach to education.